This Just In! 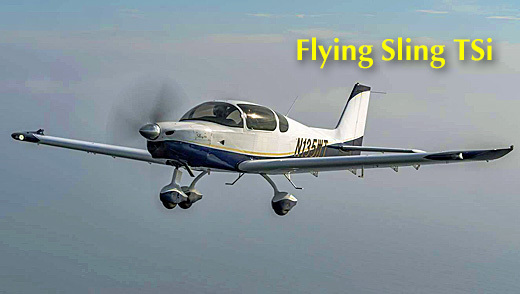 Follow the Sling TSi LIVE tomorrow, Sunday March 31st, 2019, as the new model flies this route: KTOA – KLAL (Coast to Coast) • Torrance, California to Lakeland, Florida, a distance of 1,900 nautical miles Intended Departure: Sunday at 4 AM Pacific • Landing Florida before 7 PM Eastern in a flight forecast to take “under 12 hours” at a predicted speed of 160 knots (184 mph), at altitude. You can track the flight on FlightRadar24. Why would the boys from The Airplane Factory USA make such a long flight non-stop? Their purpose is “to demonstrate the altitude, true airspeed, and endurance/economy of the Sling TSi.” They call out a normal cruise will be at 155 KTAS at 9,500 feet burning eight gallons an hour using the Rotax 915iS. The turbocharged FADEC engine will allow the airplane to climb as high as 20,000 feet. Special deals are unusual in aviation, an industry of hand-built flying machines sold in modest quantities. This is the paramount challenge in keeping aviation affordable. Challenging, but not impossible. Mainly due to the fluctuation in government currencies, The Airplane Factory USA has little choice but to raise prices by about 10%, however, they are offering a chance to capture the current price if you can make a decision before March 1st, 2018. TAF-USA has two choices depending on your wishes. I've experienced both models and find them both highly desirable. 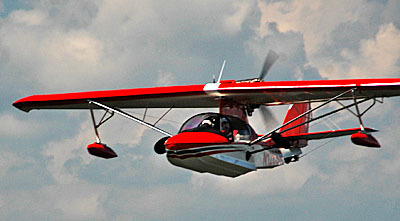 The Sling 2 — their Special LSA entry — can be had either fully built or in kit form. The four-seat Sling 4 is available only as a kit. Either is available as a quick build (QB) kit or standard. Either will save you some money in exchange for a few hundred hours of your time. 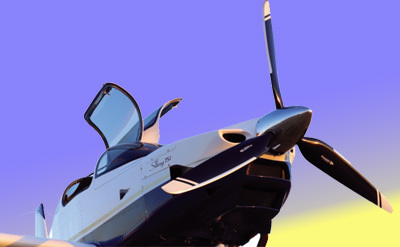 Since we focus on "affordable aviation," just how much will you part with to own a Sling 2 or 4? The ready-to-fly SLSA Sling 2 runs from $132,000 for a basic model to $165,000 for a "Garmin IFR" version. You may not consider that "affordable," but it helps identify the savings with a kit. 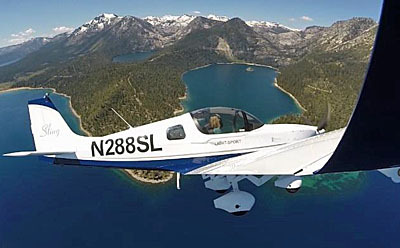 According to TAF-USA, a Sling 2 kit runs $38,000 for the airframe kit (including interior and finishing) or $83,000 with avionics, engine, and prop. That saves you more than $50,000 in exchange for 900 hours of your time. If you value your time more highly, a $17,500 QB kit will tip the scales at just over $100,000 …but even that saves $30,000, and it saves you 400 hours of your (yielding about $45/hour for your labor). TAF-USA's Sling 4 kit adds more cost but also adds more capability, specifically two more seats and the turbo Rotax 914 that adds a few knots even with the heavier load. A Sling 4 airframe kit sells for $50,000 or $115,000 with engine, avionics, and prop. Sling 4 will take more time to build: 1,200 hours. You can shave off 500 hours with the $20,000 QB kit. Act before March 1st — and save about 10%, making the offer worth about $4,000 to over $13,000 depending on which model and type interests you. Call 424-241-0341 (west coast time) or send an email for more details or to place an order. TAF-USA's all-metal CNC-accurate components come significantly completed (photo). Control surfaces are nearly finished. Wings are almost complete. Key elements like fuel tanks are finished and sealed, and where driven rivets are used, those components come already fabricated. Here's an especially modern idea, thanks to the young staff at TAF and TAF-USA. The South African producer allied with the U.S. importer helps builders with more than building manuals. They've created an iPhone/iPad app that reads the bar codes attached to every part in the kit. You scan the code and the app will display information for that part including the part’s name, where in the plans that part is used, how many parts should be included. It even keeps a running inventory of how many of those parts are used and how many are left. Prior builders may recognize how handy is the use of this modern technology. At Copperstate 2015, I finally got a chance to fly the Sling 4. TAF-USA is closely associated with MGL Avionics line (also from South Africa) so I urge you to check out these fine instruments and radios while you ponder a Sling 2 or Sling 4 kit purchase. Special deals are unusual in aviation, an industry of hand-built flying machines sold in modest quantities. This is the paramount challenge in keeping aviation affordable. Challenging, but not impossible. Mainly due to the fluctuation in government currencies, The Airplane Factory USA has little choice but to raise prices by about 10%, however, they are offering a chance to capture the current price if you can make a decision before March 1st, 2018. TAF-USA has two choices depending on your wishes. I’ve experienced both models and find them both highly desirable. 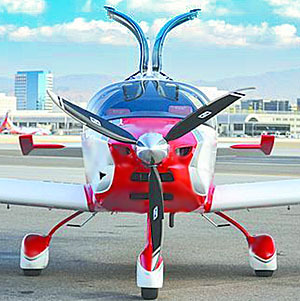 The Sling 2 — their Special LSA entry — can be had either fully built or in kit form. The four-seat Sling 4 is available only as a kit. Either is available as a quick build (QB) kit or standard. Either will save you some money in exchange for a few hundred hours of your time. Pricing the Kits Since we focus on “affordable aviation,” just how much will you part with to own a Sling 2 or 4? A good friend in aviation journalism and Editor-in-Chief of Plane & Pilot magazine is Robert Goyer. We've known each long enough to have stood around years ago at South Lakeland Airpark waiting to fly this or that new ultralight. In his Going Direct column earlier this month, Robert wrote an editorial about FAA's Part 23 rewrite project. Using an LSA viewpoint, I wanted to add some commentary to his observations. My goal here is twofold: (1) Show how success with LSA led to good things for other aircraft sectors, and (2) Show how LSA continue to significantly outpace sales of Type Certified Single Engine Piston aircraft. Robert wrote, "The FAA announced earlier this week that the Part 23 Rewrite has taken effect. This means that the rule, which gives manufacturers leeway to employ what are known as consensus standards to meet airworthiness standards instead of the FAA’s prescriptive rules. Those rules have been set in stone for decades [but the new regulation] will allow makers of planes that are sub-250-knot models to use industry standards. The effect will likely be a far cheaper certification process for these aircraft makers, hopefully without any decrease in safety." My comment — For several years, industry with FAA participation has been working on standards to certify new GA planes. These people are using the significant success of Light-Sport Aircraft following this method. LSA accident rates are, to use FAA's preferred term, "acceptable" — which is fairly high praise from the agency. 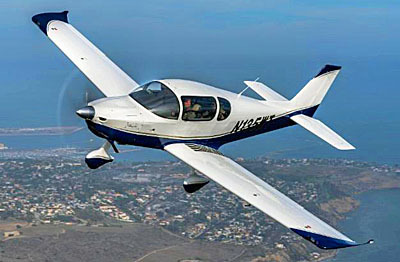 Tecnam's P2010 has FAA approval and are being sold in the USA and around the globe. Those standards, devised by industry engineers and interested private parties, have proven very solid in assuring good, reliable, airworthy aircraft. They are also credited with keeping LSA below $200,000 (with two exceptions that I know) and often under $100,000. Prices that low are far back in GA's rear-view mirror. 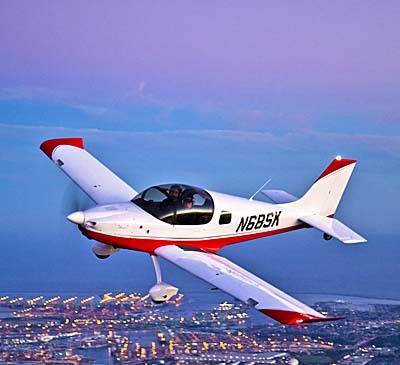 Some folks complain about LSA prices but the most expensive of them are much less than the lowest priced Type Certified single engine piston GA airplanes. Perhaps most importantly, these standards are not just for the USA. They are being used by a growing number of countries. This is vastly cheaper for LSA manufacturers than going country-by-country to gain approval. That gives those builders a larger, almost-global market, which keeps them afloat and helps them keep their prices more affordable, which is good for LSA buyers anywhere. Robert wrote, "Existing models of new planes aren’t selling fast because there are only so many people with the financial ability to pay for a half- or three-quarter-million-dollar plane." 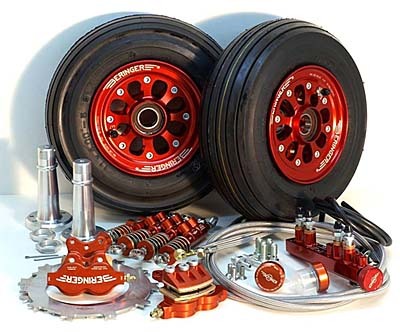 He summarizes saying, "I don’t see anything in the new rule that will cut down on the expenses [of] engines, props, tires, electronics, wiring, paint, upholstery, plastics… All of those costs will be unaffected by the rule, so that won’t affect the bottom line. The thing that will affect the cost of producing new planes is the lower cost of compliance, which represents a sizable chunk of the whole, though how much is hard to say." My comment — When I heard the price tag for a single engine, fixed gear Cirrus almost hit $1 million — for an admittedly superbly-equipped aircraft — I realized our LSA prices from $39,000 to $247,000 were much closer to the budget of most pilots I know. 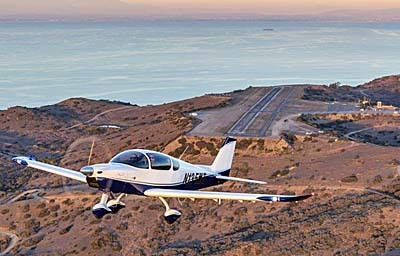 I'm amazed how Cirrus keeps selling so many airplanes but it is not their lesser priced models bringing their success. A new Cessna 172 Skyhawk costs more than $400,000, and while a Maule is much less, LSA is still the place where bargains on new airplanes are found. Further, LSA are commonly equipped with instruments you rarely find in any used GA airplanes. The average age GA plane — some 40 years old — has no digital instruments, no autopilot, and no airframe parachute. They use 1950s-era engines that burn only avgas at the rate of 8-20 gallons an hour. Contrarily, nearly all LSA have flat screens or one sort or another and they fly nearly as fast as a C-172 on half the fuel, which can be auto gas for around half the price per gallon. Even ADS-B Out gear is fairly common in LSA whereas in GA, most have still not so equipped even with the deadline looming. Interior of The Airplane Factory's Sling 4. It flies using a Rotax 914 Turbo. Robert concluded, "Why can’t a new four-seater come out built with new materials, utilizing innovative un-certified avionics, and perhaps a whole-airplane recovery parachute system? In essence, for small planes, Part 23 could be very much like Light Sport’s big brother. And by looking at LSA sales, we know pretty much how much those planes will cost: A four seater using these innovative certification and design approaches will cost $250,000 and up. That’s not cheap, but it’s a lot less than many traditionally certificated planes are going for today. Don’t misunderstand me. I hope that I’m wrong, that a slew of new manufacturers arises, putting out cutting-edge models that will go for $150,000 a copy or less. If that happens, we could see a change in the little airplane game yet, with lots of new, lower cost models. That’s a change we’d all like to see. Fingers crossed. Sling 4 is rare among four seaters to use Rotax power, but it works very well. 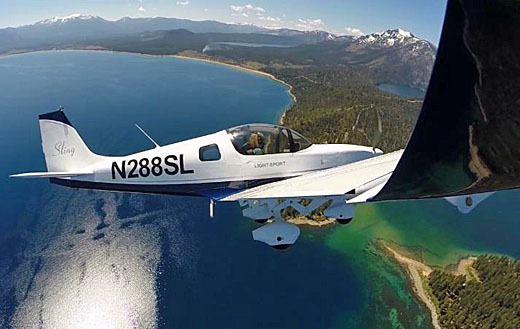 LSA sold an estimated 3,000 aircraft in 2015 where in the same year worldwide deliveries of single engine piston certified aircraft numbered 969 units. Also, see the final chart in the above linked article. More than 66,000 LSA or LSA-like* aircraft are flying around the globe. Most of these have been sold in the last 15-20 years, a delivery pace far faster than all GA-SEPs. I expect this trend to continue. For those intrigued by the numbers here's another article on worldwide aviation statistics. Happy flying LSA or light kit aircraft lovers! You are in aviation's sweet spot. Enjoy! * "LSA-like" is a term describing aircraft that very much resemble America's LSA but may not be called that because each country has its own definitions. A good friend in aviation journalism and Editor-in-Chief of Plane & Pilot magazine is Robert Goyer. We’ve known each long enough to have stood around years ago at South Lakeland Airpark waiting to fly this or that new ultralight. In his Going Direct column earlier this month, Robert wrote an editorial about FAA’s Part 23 rewrite project. Using an LSA viewpoint, I wanted to add some commentary to his observations. My goal here is twofold: (1) Show how success with LSA led to good things for other aircraft sectors, and (2) Show how LSA continue to significantly outpace sales of Type Certified Single Engine Piston aircraft. Robert wrote, “The FAA announced earlier this week that the Part 23 Rewrite has taken effect. This means that the rule, which gives manufacturers leeway to employ what are known as consensus standards to meet airworthiness standards instead of the FAA’s prescriptive rules. "Oshkosh is all about airplanes, right?" asked The Airplane Factory USA's Jean d'Assonville. I loved his remark since that is how we promote ByDanJohnson.com. "It's all about the airplanes!" is how we modeled our line after Apple's Steve Jobs famously said, "It's all about the music," when promoting iPod (remember those!?) in the early 2000s. Jean — one of the TAF heroes who has done long portions of the South African company's several (yes, several!) flights all around the globe — went on to write, "This was my third Oshkosh and what rang true for me is that Air Venture is actually all about people who love airplanes! It is the people who dream them, build them, fly them, polish them, sleep in or under them and just simply love them. Yes, it's the people!" Jean is right. The airplanes are the main message here and at AirVenture but they exist to give satisfaction, education, and inspiration to those who fly our wonderful light aircraft. The Airplane Factory USA's Sling Taildragger. The Airplane Factory USA assembled a team of ten to man the stand. "It's always enjoyable sharing the Sling story because it is a pilot's airplane that has been refined by pilots for pilots," observed Jean. TAF-USA reported that their Midwest SkySports' build center had two of their beautiful Sling 2 LSA on display. In addition, the Southern California company based at the famous Torrance Airport (near Los Angeles) brought the legendary Sling 4-4-40, a four seat model that was built from a kit in 4 days by 40 people. Their main display was in the kit-centric North Aircraft Display area but TAF-USA also had an exhibit in the ultralight arena, now commonly called the Fun Fly Zone. Jean discovered a fact of Oshkosh. "As a demo pilot during the Air Venture, it's really exciting — but quite stressful — flying in the extreme traffic with only 500 feet of vertical separation while only listening (not talking back) on the radio," he said. "It was worth it, though. Almost everyone that went for a demo flight has purchased or is in the process of purchasing a Sling aircraft or a kit." * With 20% down, 15 year term, fixed rate as low as 5.24% (4.99% with 25% down) through AOPA Finance. To keep up with demand and spark more TAF-USA hired Barry Jay as North American Sales and Marketing Manager, who will work closely with Matt Liknaitzky and Jean D'Assonville. "Barry comes to us with decades of experience in the general aviation and automotive industries," said The Airplane Factory USA. Jay has sold new Piper and Mooney aircraft, managed Lexus national advertising and worked with Toyota's aviation business development department." A private pilot with over 900 hours, Barry has been a member of the Sling Flying Club for over four years and has been a strong promoter of The Airplane Factory brand. An FAA Safety Team Representative, Barry was also recently reelected to the post of President of the Torrance Airport Association for a twelfth term. “Oshkosh is all about airplanes, right?” asked The Airplane Factory USA‘s Jean d’Assonville. I loved his remark since that is how we promote ByDanJohnson.com. “It’s all about the airplanes!” is how we modeled our line after Apple’s Steve Jobs famously said, “It’s all about the music,” when promoting iPod (remember those!?) in the early 2000s. Jean — one of the TAF heroes who has done long portions of the South African company’s several (yes, several!) flights all around the globe — went on to write, “This was my third Oshkosh and what rang true for me is that Air Venture is actually all about people who love airplanes! It is the people who dream them, build them, fly them, polish them, sleep in or under them and just simply love them. Yes, it’s the people!” Jean is right. The airplanes are the main message here and at AirVenture but they exist to give satisfaction, education, and inspiration to those who fly our wonderful light aircraft. You should already know the Sling. The South African design set a new benchmark by coming off design and initial development to take an east-to-west trip around the globe. That showed the confidence of designers Mike Blyth and James Pittman. At Sun 'n Fun 2013, we spoke with reps from The Airplane Factory USA who answered questions about flight characteristics and future plans plus talk about the kit Sling they're assembling. Watch this video to get all the facts. You should already know the Sling. The South African design set a new benchmark by coming off design and initial development to take an east-to-west trip around the globe. That showed the confidence of designers Mike Blyth and James Pittman. At Sun ‘n Fun 2013, we spoke with reps from The Airplane Factory USA who answered questions about flight characteristics and future plans plus talk about the kit Sling they’re assembling. Watch this video to get all the facts. As I've indicated many times in the last couple years, this website seeks to deliver news and video about Light-Sport Aircraft, light kit aircraft, ultralights, and light GA aircraft. The latter refers to four seat (and larger) aircraft created by the same companies that make LSA or kits. Specifically, I do not plan much on Cessna, Piper, Cirrus, Diamond, and other legacy brands as every magazine already examines these every month. Instead, I plan to cover emerging models from companies that established their brand in the LSA space: Tecnam, Flight Design, Pipistrel, Evektor, Van's and The Airplane Factory. These six manufacturers are presently in the four seat game either with ready-to-fly aircraft or four seat kits. More are expected to follow. At Copperstate 2015, I finally got a chance to fly the Sling 4 from The Airplane Factory, which I had been anticipating since enjoying the Sling LSA. The South African company has a rich history in light aircraft, with principal Mike Blyth flying weight shift trikes all over the world, including several epic journeys. He certainly "gets" all manner of light aircraft and sought to make a four seater, which, of course, he also flew around the world. Such voyages a something of a habit for Mike. Sling 4 uses Rotax power, in this case the turbo-charged 914 model. (I'll bet they start using the 135-horsepower 915 when it becomes available. I witnessed Mike paying close attention when the new powerplant was announced at Oshkosh 2015.) Like the two seat Sling LSA, Sling 4 is all-metal excepting some composite elements. Except for the second row of seats (see last photo), Sling 4 looks much like the Sling LSA. I'd call that a very good thing as the LSA model is a comfortable machine. Different from Sling LSA that uses a sliding canopy, Sling 4 has a couple upward-hinging doors that allow easy enough entry though you must first climb up on the wing. I didn't get in the rear but TAFer Jordan Denitz made it look easy enough. Naturally, as TAF-USA entrepreneur Matt Litnaitzky also represents the MGL Avionics line (also from South Africa), Sling 4 uses these fine instruments and radios. Sling 4 featured twin large EFIS screens. Unlike Sling LSA, for which we did a full Video Pilot Report that you'll see before too long, I did not do a full review of Sling 4. However, my 20-minute experience with it suggested I could really come to like the airplane. It flew very nicely and offers the extra space some covet. Useful load is significant even with — and partly because of — the small-ish Rotax engine. Sling 4 felt a bit heavier, which of course it is, but it exhibited the same wonderful handling I'd enjoyed on Sling LSA. Perhaps best of all for those trying to not break their budget, Sling 4 is quite modestly priced, barely into six figures. Naturally, you'll have to build this model but the TAF boys say it is a reasonable project. Since you need a medical to fly a four seater like Sling 4, you may want to know more about the effort to move beyond the Third Class Medical. EAA states, "Third-class medical reform is closer than ever before, but it's a complex issue ..." "Almost anyone who has held a regular or special issuance third-class medical certificate within the 10 years preceding the date the legislation is enacted will never again need to visit an aviation medical examiner (AME). If you've never held a third-class medical certificate, you will need to get a medical certificate. If your regular or special issuance medical certificate lapsed more than 10 years before the legislation is enacted, you will need to get a medical certificate. And if you develop certain cardiac, neurological, or psychological conditions, you will need a one-time-only special issuance medical." The legislation is by no means a done deal. "A number of lawmakers made it absolutely clear that they would not support legislation that completely eliminated the third-class medical," clarified EAA. "The compromises Sen. Inhofe arrived at represent the very best deal possible for pilots while winning sufficient support in Congress to keep the legislation alive." Even if it passes in the Senate and the House and gets the president's signature, FAA then enters into rule making and a minimum of a year will pass before you can use the proposed new privileges. The initiative's cosponsor, AOPA, wrote, "Both chambers must pass the bill and reconcile any differences before it can go the president for his signature." The big member organization added, "The original language of the Pilot's Bill of Rights 2 did not have enough support in the Senate. It was not going to pass or move forward in its original form." Being completely honest, AOPA noted, "Even with all the progress, there's still work to do. Few things move forward quickly in Congress." To get all the info EAA (and AOPA) offers, visit this FAQ link. As I’ve indicated many times in the last couple years, this website seeks to deliver news and video about Light-Sport Aircraft, light kit aircraft, ultralights, and light GA aircraft. The latter refers to four seat (and larger) aircraft created by the same companies that make LSA or kits. Specifically, I do not plan much on Cessna, Piper, Cirrus, Diamond, and other legacy brands as every magazine already examines these every month. Instead, I plan to cover emerging models from companies that established their brand in the LSA space: Tecnam, Flight Design, Pipistrel, Evektor, Van’s and The Airplane Factory. These six manufacturers are presently in the four seat game either with ready-to-fly aircraft or four seat kits. More are expected to follow. At Copperstate 2015, I finally got a chance to fly the Sling 4 from The Airplane Factory, which I had been anticipating since enjoying the Sling LSA. Michael Smith and son pose with the Southern Sun Searey. Yellow line is the route and red circle is where the Sling pilots were at the time. Yikes! Similar to the Quantas flying boat, Boeing's B-314 had multiple levels, large passenger compartments, a dining room, and seat unfolded to become beds. In the nearest engine nacelle, a mechanic works on the engine in flight. Flight crew had large tables to review maps. Among the critiques some old school pilots employ when trying to marginalize Light-Sport Aircraft is that these aircraft are not suited to flying long distances. I've reported several around the world flights (check this article and here's another) but that's hardly all the long flights. The invitation started out, "Join all of us at Progressive Aerodyne and the City of Tavares on Friday, September 11 for a presentation by Michael Smith about his epic Searey flight from Melbourne, Australia to Central Florida. Michael will give a presentation at the beautiful Tavares Pavilion on the Lake about his incredible journey." Unfortunately, I can't attend as I'll be working the Midwest LSA Expo in Mt. Vernon, Illinois that weekend. However, many readers probably cannot attend either so here's a bit of Michael's story. In the not-too-distant past, documenting a trip like his probably meant appealing to a magazine or publishing a book. Either would be challenging and by the time it was printed and distributed, it would be dated. Thank goodness for the Internet and a website called TravelPod that allowed many to follow in near real time. At the outset, Michael wrote, "The plan is to loosely follow the Qantas Empire Flying Boat route of 1938 from Sydney to London in the Searey amphibian aeroplane named 'Southern Sun.'" Of course, Quantas was a giant flying boat and the S.S. Searey is tiny plus Michael would fly solo. His blog continued, "The story of the grand flying boats on the pre-war era I found captivating. All of the research I was doing [for my flight] came together when [I visited] an excellent exhibition of the Flying Boat era in Sydney. I snapped up photos of dsplays, maps, itineraries and the like, and decided, one day, I would really like to do that." Michael notes that his Searey has "a similar range to the flying boat airliners of 1938 ... just a little less amenity and comfort." He observed, "Those planes were conceived with [ocean-crossing] ship comfort in mind, with three levels of decks, lounge chairs, even mini golf." Then he added dryly, "I lack most of those facilities ..." Unlike a record-setting dash, Michael chose to make his an enjoyable expedition, pausing in each city for a day or two "to seek out the old landing spots and hotels that were used" by the airline companies. For those of you who read his travel blog, you can find plenty of info with numerous photos chronicling his discoveries along the route. While the first legs allowed more frequent stops, departing England got serious. Admitting that unlike the airlines, "I don't have the range to do Ireland to Canada direct," Michael shows his explorer side saying, "I've always been keen to see a few islands in the North Atlantic." This comment sums up the North Atlantic crossing, "Deep down ... I was apprehensive about this flight. It was only a 575 mile leg, and while I had fueled the plane close to the gills to give me spare range, it's a long passage over some very cold water." You might think he would simply climb to the safest altitude but that's not possible Michael discovered. 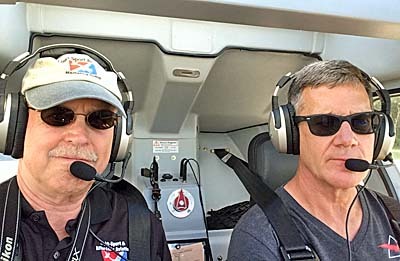 "Flying VFR over the Atlantic means staying out of controlled airspace, which starts at 6,000 feet, and as [I was] heading west that meant 4,500 feet." It is more important to watch winds at various levels to minimize fuel use. Having extra height to extend a glide is less meaningful over the North Atlantic. Despite his apprehension, 9.2 hours later he landing in Iceland. I recommend you read about Michael's long trip via his regular posts on TravelPod . He's quite an engaging writer and in this way you can follow his experiences. I found it a fascinating travelogue. Is Michael done with these long distance flight? It certainly does not sound like it, and after a success flying half-way around the world, who knows? Here's how he ended his 53-part travel blog, "I'm flying home with Qantas on Monday. On the whole 'what's next question,' that needs some thinking, but I do note on today's track map there is an interesting island south of Florida that Americans can't currently visit ..." I'll bet we see more from Michael. Another Very Long Flight Underway ... In a completely different attempt, we continue following the flight of a Sling LSA as it circles the globe. (See earlier article.) Flying even farther than Michael Smith and the SS Searey, these fellows have no boat hull under them as they cross two oceans. However, they have experience as TAF aircraft have now three times done a circumnavigation of the Earth. So much for LSA not flying long distances (though one of the TAF flights was their four seater, presently built as a Experimental). 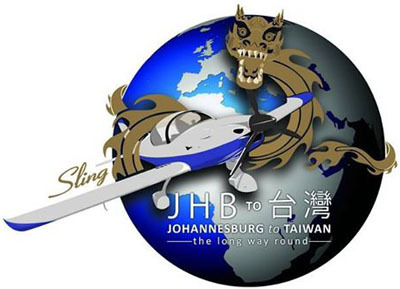 The U.S. Sling company wrote, "The 2015 Sling Around the World Expedition is once again underway! 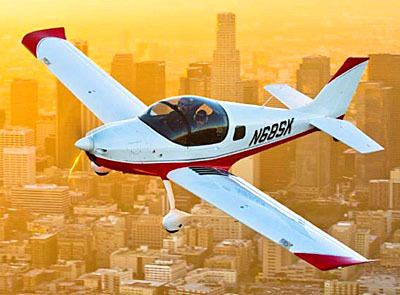 After a month's rest in Los Angeles, Patrick Huang of the Airplane Factory Asia was joined by Jean d'Assonville of The Airplane Factory USA, a veteran Sling circumnavigator, and the two took off from Torrance, California for Hawaii on Saturday, August 29th. "Once situated in their trusty steed — the South African registered Sling ZU-TWN — the pair made a quick fuel stop in San Luis Obispo, CA (KSBP) and then began the non-stop flight to Hawaii. They originally planned for a stop in Maui, but after favorable tailwinds and a fuel burn of 4 GPH, they amended plans and flew even further to Honolulu, PHNL. Total flight time was around 21.5 hours and fuel used was 102 gallons. "After a check of the weather they determined it would be best to make a quick turn around and were back in the air the very next day. They took off from Honolulu at 7:38 Pacific time on Monday, August 31st and began the long journey to Majuro (PKMJ) in the Marshall Islands. They were in constant communication with TAF's team in both the USA and South Africa, who navigated them around a few Pacific Ocean storms (image). Some favorable tailwinds were seen initially and after 19.5 hours and over 2,000 nautical miles, they landed on the beautiful coral atoll of Majuro." The Sling trip is underway as this is written but, as with Michael Smith's voyage, you can follow the pair en route. This blog link describes the trip. Or go to TAF USA's Facebook page. Among the critiques some old school pilots employ when trying to marginalize Light-Sport Aircraft is that these aircraft are not suited to flying long distances. I’ve reported several around the world flights (check this article and here’s another) but that’s hardly all the long flights. The invitation started out, “Join all of us at Progressive Aerodyne and the City of Tavares on Friday, September 11 for a presentation by Michael Smith about his epic Searey flight from Melbourne, Australia to Central Florida. Michael will give a presentation at the beautiful Tavares Pavilion on the Lake about his incredible journey.” Unfortunately, I can’t attend as I’ll be working the Midwest LSA Expo in Mt. Vernon, Illinois that weekend. However, many readers probably cannot attend either so here’s a bit of Michael’s story. In the not-too-distant past, documenting a trip like his probably meant appealing to a magazine or publishing a book. Light-Sport Aircraft comprise an diverse gaggle of some beautiful airplanes. Choices are available in a dizzying array of configurations and variations. In fact, so many selections are available to you (as Special LSA) that I created PlaneFinder 2.0 to help folks narrow the decision to a few that might best suit your needs, interests, experience, and budget. If you haven't checked out this cool feature, you should do so. You can click on and off more than 20 different aircraft characteristics, all simple yes-or-no type entries. As you do so, the "Matching List" changes to show the aircraft that meet your criteria. From that list you'll see links that let you read more content (written and video) available on this website. You must register to use PlaneFinder 2.0 (your email is all that is required and after you do so we'll send you a regular English-word password that you can change), however, PlaneFinder 2.0 is completely free, like most of our content. Go have fun! Many LSA are available as nose wheel, tricycle gear airplanes. Some are taildraggers. Some go both ways. If you're not sure about your ability to fly a taildragger I have two things to say: (1) LSA taildraggers are not that challenging to fly for a variety of reasons (some of which I'll mention below), and, (2) taildraggers look so cool. So, I don't know about you but when I heard about the Sling taildragger I almost started an involuntary Pavlovian drool. I've enjoyed flying Sling in nosedragger form — see this article — but, ooh la la, a taildragger ... now that get's my blood flowing freely. 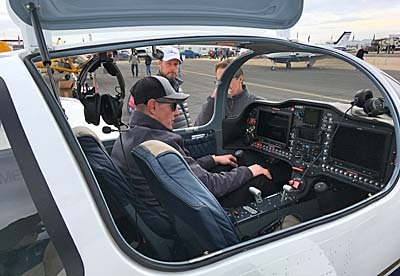 "I flew about 20 hours in the Taildragger while it was here [at our Torrence, California facility]," said U.S. importer Matt Litnaitzky of The Airplane Factory USA. He also reported flying a few more hours in South Africa a year ago. The Airplane Factory is a South African producer of Sling, Sling 4 — their four seater — and who knows what else might be coming from this hard-working manufacturer. "The Sling Taildragger is almost identical to the regular [tricycle gear] Sling LSA, save for the landing gear configuration," Matt continued. "It features dual toe brakes, whereas the tricycle version is delivered standard with direct steered nosewheel and hand-operated brake." As a taildragger, differential braking such as with toe brakes, is important to allow better ramp maneuverability. However this introduces the potential for the dreaded ground loop. So, let me address this for a few lines. For those that may be new to taildraggers, a ground loop is not really a "loop" in the common aeronautical use of that word. It means that, due to the mass of aircraft aft of the main gear, should the pilot let the tail end move too far toward either side with some element of momentum in that movement, the tail can come more aggressively to the side. With a high wing or low, a sideways moving tail can cause a wing tip to strike the ground, whether somewhat gently or more forcefully. When a wingtip located far from the aircraft center of mass drags on the ground, leverage causes even more movement the wrong way and that can result in quite a twirl on the ground ... the "ground loop." Usually the damage is not too significant and it is the pilot's ego that is more seriously wounded. However, with enough force and speed involved, it can be quite a bit worse. Being relatively light aircraft usually landing at fairly slow speeds, and often having a lower deck angle — meaning the nose is not particularly high compared to the horizontal — LSA ground loops are much less likely and not as much bad stuff happens when one occurs. 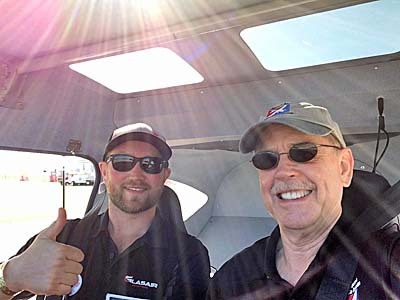 The solution, instilled by a quality taildragger checkout from a knowledgeable instructor or experienced pilot, often involves what is called "happy feet." If you keep your feet moving on the rudder pedals — using a series of small regular movements, to prevent the tail from getting too far to one side or the other — the ground loop is easily avoided. On something like a DC-3 this is a very big deal. On most LSA, it simply shouldn't dissuade you from trying a taildragger. Did I mention they look SO cool? Until I can fly Sling taildragger, I'm happy to pass along Matt's further comments. "During taxi, the Sling Taildragger provides sufficient visibility down the runway to see straight ahead without S-turning," said Matt. He elaborated, "The gear geometry is such that when the tail comes up on the takeoff roll, the aircraft remains extremely steady on the runway, with very little steering input required. "In flight she shares the same light control harmony that the standard Sling has, since it is the same airplane. Three-point landings are a breeze in the Sling Taildragger and control is easily maintained on the rollout. "The Sling LSA Taildragger [sells for] approximately the same price as the Sling LSA (starting at $135,000), but the gorgeous lines of the Sling are accentuated by the aggressive nose-up stance on the ground. All photos with this article were captured by photographer Evan Byrne, whom interested parties can contact at his aerial photography web address. Thanks, Evan! Light-Sport Aircraft comprise an diverse gaggle of some beautiful airplanes. Choices are available in a dizzying array of configurations and variations. In fact, so many selections are available to you (as Special LSA) that I created PlaneFinder 2.0 to help folks narrow the decision to a few that might best suit your needs, interests, experience, and budget. If you haven’t checked out this cool feature, you should do so. You can click on and off more than 20 different aircraft characteristics, all simple yes-or-no type entries. As you do so, the “Matching List” changes to show the aircraft that meet your criteria. From that list you’ll see links that let you read more content (written and video) available on this website. You must register to use PlaneFinder 2.0 (your email is all that is required and after you do so we’ll send you a regular English-word password that you can change), however, PlaneFinder 2.0 is completely free, like most of our content. South African long-distance pilots Mike Blythe and Patrick Huang arrive to cheers and a warm welcome from dozens of their fellow countrymen. Cameras were clicking and videos were filming. A surprise awaits under wraps for a big announcement Monday morning as AirVenture Oshkosh 2015 opens. It’s almost time! — The tents are in place. Most of the displays are built. Airplanes are already parked by the thousands in EAA voluminous parking areas. The campground and every hotel room for miles is packed full. While the usual pandemonium reigns the night before opening, it is a familiar scene that somehow, almost magically resolves into a ready-to-go show on opening day only hours away, tomorrow, Monday July 20th, the earliest start to AirVenture Oshkosh in years. Today, I got a text — thank some tech guru for inventing text, which always seems to get through quickly even when phone calls do not, with hundreds of thousands of attendees all using their smartphones at the same time. The text from The Airplane Factory USA‘s Matt Liknaitzky read, “Mike [Blythe] and Patrick [Huang] are arriving in the Sling 912 iS … if ya wanna see them.” We did, so we dashed north to the North Aircraft Display Area space. Sling owner Patrick Huang (L) poses with Matt Litnaitzky and Paul Hamilton (R) and TAF USA members Jean and Jordan. When you deliver an airplane to an accomplished video producer you are bound to get some great photos out of the deal. The images with this article show video impresario (and my longtime friend), Paul Hamilton, flying new Sling N288SL around beautiful Lake Tahoe not far from his home base in Nevada. Paul has been around light aviation for more years that he may be willing to admit. He has long promoted weight shift aircraft and was influential in developing early LSA training documents and videos in addition to making several video productions that were enjoyable to watch. 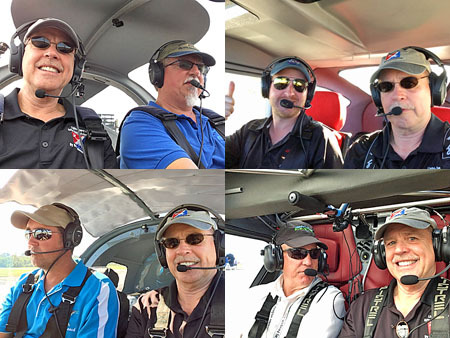 The Airplane Factory USA boss Matt Liknaitzky wrote, "It was another great showing for the Sling at Sun 'n Fun 2015 and our team has been busy ever since." Regarding the new delivery, he added, "In some recent exciting news, another Sling has stretched its wings! N288SL, a brand new Sling [powered by the fuel injected Rotax] 912iS, made the journey to its new home at Paul Hamilton's Sport Aviation Center at the Carson City Airport (KCXP). 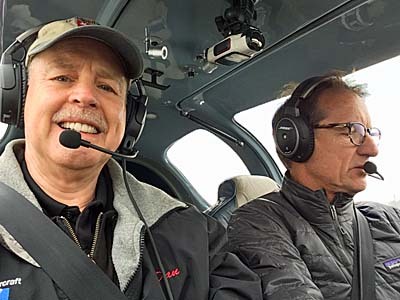 Paul, an industry leader and renowned Sport Pilot Examiner and Instructor, offers primary flight training for both Sport and Private Pilot Certification." Paul confirmed the delivery to owner Patrick Huang of Top View Aviation, writing, "Sling has the best handling characteristics, modern glass panels, and convertible top to make this the best LSA airplane in its class. This is our primary airplane for Sport and Private training and FAA certification." New Sling owner Patrick is also involved in establishing TAF Asia. Based in Taiwan, his operation in that part of the world recently took delivery of three aircraft with plans to assemble the Sling for the Asian market. Paul runs a full-service operation with five full-time instructors in a location featuring excellent flying weather year 'round. He also has FAA Designated Pilot Examiners to make it easy for students or transitioning pilots to earn a Sport Pilot or Private Pilot license in airplanes or weight shift trikes. Those interested can also go on to become a Sport Pilot Certified Flight Instructor (CFIS) for either airplanes or trikes. His Hamilton Pilot Training System is a very complete package with all you need to study for the certificates when not flying one of the Sport Aviation Center aircraft. The Airplane Factory USA is based in southern California at the famous Torrence Airport (not far south of the main Los Angeles airport). A related enterprise offers the also South African line of MGL Avionics that you see in Slings, of course, but also in many other aircraft around the USA and the world. TAF-USA has new and used Slings available for immediate delivery. For those contemplating a purchase but who don't want to wait months for delivery, this can be most welcome news. TAF said, "N232SL is a brand new Sling LSA, fitted with the 912iS fuel injected engine, autopilot and dual MGL iEFIS touchscreens. Parachute installation is optionally available as parachute cables are already in place." 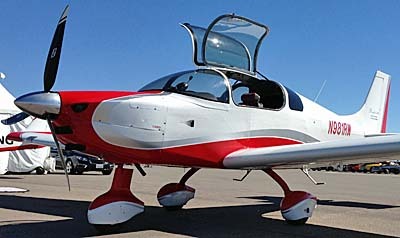 The LSA has the same color scheme and panel as the aircraft shown in photos accompanying this article. "The plane is fully registered and has its airworthiness certificate," said Matt, "She is ready for immediate delivery." If interested, send them an email. The California importer also has a very well equipped Sling with 700 hours logged that probably won't last long. In addition to other desirable gear, this one is already fitted with an airframe parachute system. The Airplane Factory is an ambitious lot. 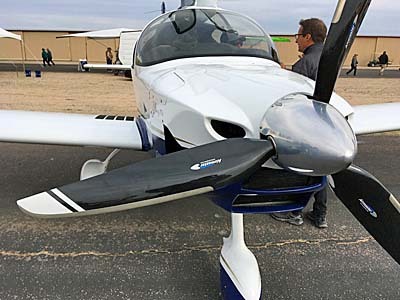 Not only do they offer the Special LSA Sling model, they can also deliver FAA-approved kit versions and those can include the company's four seat Sling 4 as well. As we are currently planning, I'll go up with Matt at AirVenture 2015 to see how their four seater flies. TAF is the company whose founder, Mike Blyth, has flown around the world in both his Sling 2 and Sling 4 models, each of which globe-girdling expeditions followed some very long flights in weight shift aircraft. Beside being a successful airplane developer and manufacturer, Mike has shown great ability in producing videos of these adventures, my favorite of which is his South-to-South adventure of flying 27,000 miles from the Antarctic side of South America, up through North America, across the Atlantic and all the way back down through Europe and Africa to South Africa ... the entire way unsupported by ground crew. In my mind that shows not only great confidence in your aircraft and your capabilities but also a spirit of exploration few of us will ever duplicate. I won't be trying to emulate Mike but I enjoy following his flying feats. When you deliver an airplane to an accomplished video producer you are bound to get some great photos out of the deal. The images with this article show video impresario (and my longtime friend), Paul Hamilton, flying new Sling N288SL around beautiful Lake Tahoe not far from his home base in Nevada. Paul has been around light aviation for more years that he may be willing to admit. He has long promoted weight shift aircraft and was influential in developing early LSA training documents and videos in addition to making several video productions that were enjoyable to watch. The Airplane Factory USA boss Matt Liknaitzky wrote, “It was another great showing for the Sling at Sun ‘n Fun 2015 and our team has been busy ever since.” Regarding the new delivery, he added, “In some recent exciting news, another Sling has stretched its wings! N288SL, a brand new Sling [powered by the fuel injected Rotax] 912iS, made the journey to its new home at Paul Hamilton’s Sport Aviation Center at the Carson City Airport (KCXP). 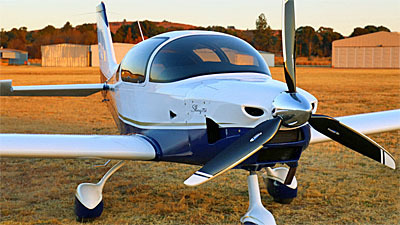 Madiba Bay School of Flight uses The Airplane Factory Sling models, which are nearly always equipped with MGL Avionics. Both have representation in the U.S.
One year ago Rotax announced a contest to award a brand-new 912 engine to the flight school that achieved the first time between overhaul (TBO) of 2,000 hours on a Rotax 912 iS model that the engine builder had just released. 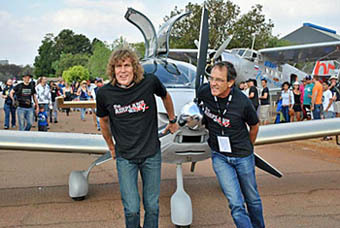 Upon reaching the goal, the flight school had to prove the hours by sending a copy of the logbook to their local distributor and then return the used engine to Rotax BRP in Austria. At the end of January 2015, Rotax announced they had donated a copy of their newest Rotax 912 iS Sport engine to Madiba Bay School of Flight located in Port Elizabeth, Eastern Cape, South Africa. "Madiba Bay achieved the first time between overhauls (TBO) of 2,000 hours on their Sling 2 equipped with a Rotax 912 iS engine," said representatives of the big Austrian engine manufacturer. Flight school owner Gerhard Van Eeden said, "We are pleased to be the winner of a brand-new Rotax 912 iS Sport engine. Our school flies a minimum of 400 hours monthly, a good reason why we decided to participate in this ROTAX contest as we were convinced we could win." The contest started in February 2014. At the rate Madiba Bay racks up hours on their Sling aircraft, they were well positioned to win a powerplant that retails for well over $20,000. The school reported 400 hours per month using several airplanes and they managed to log 2,000 on at least one in less than a year. Not bad! "It's impressive to see how obviously professional Madiba Bay School is in operating its flight school to accumulate 2,000 hours in such a short time," said Thomas Uhr, Vice President BRP-Powertrain and General Manager BRP-Powertrain GmbH & Co KG. "And, of course, it makes me proud our Rotax 912 iS Sport was a hassle-free partner for many new pilots and it will now provide valuable information to our continuous R&D efforts, delivering the best aircraft engine in its class." Rotax believe that flight schools benefit using the Rotax 912 iS Sport thanks to "easier operation, longer flight range and lower operating costs. The new engine delivers 38% to 70% better fuel efficiency than comparable competitive engines," added Uhr. "For flight schools, the Rotax 912 iS Sport engine is economically extremely valuable considering that a cost-intensive part for flight schools is the vast quantity of fuel [they use]." So, that's it. The contest is over, right? Nope! They are doing it again. "Rotax BRP will continue last year's flight school contest and will donate a brand new Rotax 912 iS Sport to the flight school that achieves the first TBO of 2,000 hours on their Rotax 912 iS engine," the company stated in an early February news release. The procedure is similar to the 2014 contest: Flight schools must register with an authorized Rotax distributor or with the person in charge of the point of sales in its area. The school must inform the distributor when 500, 1,000, 1,500 and 2,000 flight hour points are reached using the Rotax 912 iS engine. After reaching 2,000 hours, the school sends their logbook to their distributor, which is to inform Rotax BRP, afterwards shipping the engine to Rotax. BRP will then donate a new Rotax 912 iS Sport engine in return, and the school saves a bundle on either overhaul of their old engine or buying a new one. Madiba Bay is not allowed to participate in the contest again. "With more than 170,000 aircraft engines sold in almost 40 years, Rotax dominates the Light-Sport and microlight aircraft industry offering more than 200 points of sale," stated the company. "Rotax BRP supports customers worldwide and supplies Rotax aircraft engines to more than 80% of all aircraft manufacturers in its segment." Madiba Bay School of Flight uses The Airplane Factory (TAF) Sling aircraft in their active flight school. So, besides Rotax enjoying strong support for their engines, TAF also earns credit for their aircraft holding up to duty that is often said to be one of the most demanding. Students don't learn without making mistakes so hard landings happen. The traditional U.S. flight school community has been somewhat slow to embrace LSA because some allege that LSA are too lightly built. 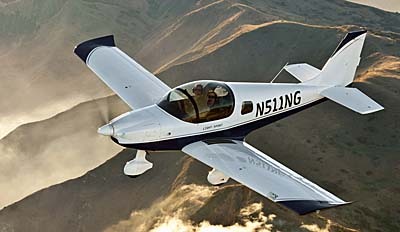 Indeed LSA weigh more than 300 pounds less than popular trainers like Cessna's long-discontinued 150 and 152 models. However, experiences such as Madiba Bay with their Sling fleet and many other Light-Sport models with thousands of training hours logged are proof that in the hands of quality flight school operators these fuel-efficient aircraft can be great instructional aircraft. Video reports and articles like the following unveil the durability of LSA in flight training environments: Kitfox (video); Allegro; Europe-based Remos; and, this general article. One year ago Rotax announced a contest to award a brand-new 912 engine to the flight school that achieved the first time between overhaul (TBO) of 2,000 hours on a Rotax 912 iS model that the engine builder had just released. 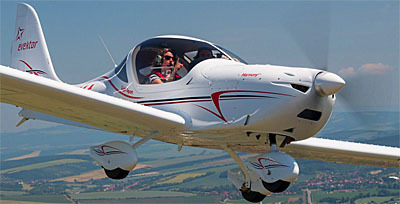 Upon reaching the goal, the flight school had to prove the hours by sending a copy of the logbook to their local distributor and then return the used engine to Rotax BRP in Austria. At the end of January 2015, Rotax announced they had donated a copy of their newest Rotax 912 iS Sport engine to Madiba Bay School of Flight located in Port Elizabeth, Eastern Cape, South Africa. 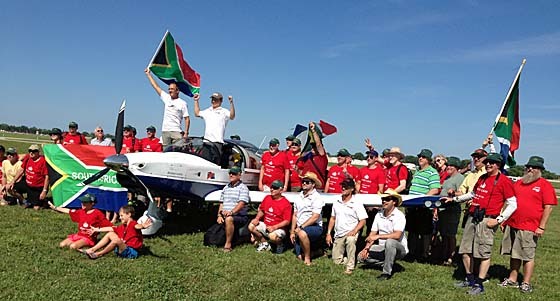 “Madiba Bay achieved the first time between overhauls (TBO) of 2,000 hours on their Sling 2 equipped with a Rotax 912 iS engine,” said representatives of the big Austrian engine manufacturer. Flight school owner Gerhard Van Eeden said, “We are pleased to be the winner of a brand-new Rotax 912 iS Sport engine. 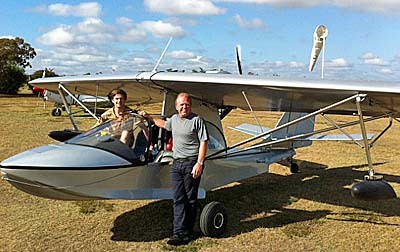 The Airplane Factory pilot launches the new Sling Taildragger in South Africa. BRM Aero has reconfigured its shapely Bristell into a taildragger called TDO (for Taildragger Option). Taildraggers may be among the least understood and most feared aircraft available in the LSA space ... or for that matter throughout general aviation. While we have many good choices that I'll list below, I have nonetheless heard from many readers or airshow visitors that they are uncertain about their operation of an aircraft that has no nosewheel. If you have no taildragger skills, you'll also find it a challenge to get proper flight instruction in a "standard" aircraft. For those seeking new skills in flying, however, taildraggers may provide high satisfaction. Most who have crossed the barrier to taildragging subsequently look very fondly at such aircraft, seeing a sleeker yet gutsier, more rugged appearance. Of course, nosewheels dominate general aviation as they can be easier to land, especially in crosswinds, but once you learn the lesson of "happy feet" — or keeping your feet active on the rudder pedals throughout approach and touchdown — you may always yearn for more taildragger time. 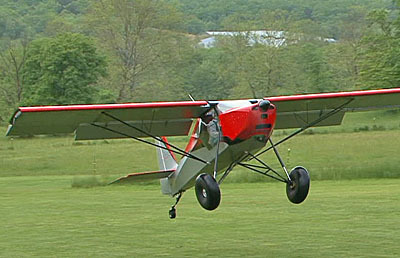 Photos accompanying this article illustrate two established nosewheel designs now offered in taildragger configuration. Both are new to the market but they join quite a flock. Consider these other taildragging Light-Sport Aircraft: Tecnam's Taildragger • the long popular Kitfox • Rans' S-6, S-7, and S-20 • Renegade's taildragging Falcon • Just Aircraft's SuperSTOL and Highlander • Aerotrek's A220 • FK Lightplanes' aerobatic Comet • Phoenix Air's motorglider • and Pipistrel's Sinus motorglider ... and these are just the landplanes. Plus, I've left out a few models that appear to have gone quiet in the marketplace. LSA seaplanes can also be taildraggers (as well as pusher designs). Icon's highly visible A5 is a nosedragger as are Super Petrel, SeaMax, Mermaid, and Freedom that feature retractable nosewheels, yet taildragger LSA seaplanes include Progressive Aerodyne's Searey and Lisa's Akoya. The splashy new MVP and Wave seaplanes still in development plan to offer what might be called "hybrid" landing gear configurations (more on them in the future). Of course, the Cubalikes are taildraggers in keeping with their vintage looks; likewise for the Savage series. Work aircraft like the Dragonfly hang glider towplane are also well served by being taildraggers. 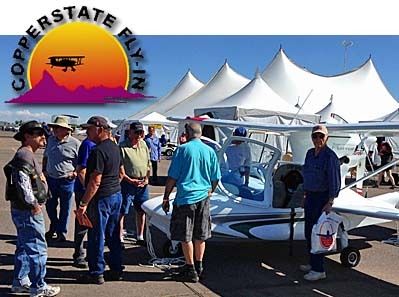 The Airplane Factory USA's always upbeat team led by Matt Liknaitzky reported, "After a wonderful trip to the Copperstate Fly-In [we] sold [our] first U.S. based Sling Taildragger or Sling TD. This tailwheel version of the Sling 2 is the latest model designed by Mike Blyth and The Airplane Factory team." Matt added that the South African factory has received the order and has already begun the production process. "This beauty should arrive in the U.S. in about 6 months and we can't wait to have her join the Sling family," said Matt. 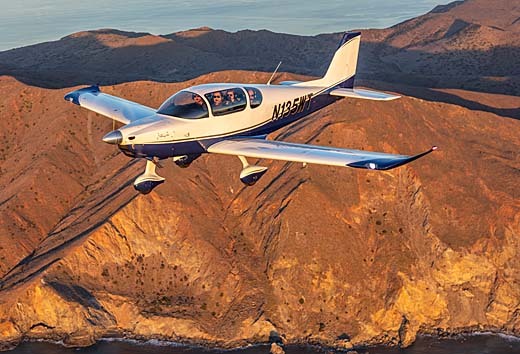 He also noted that beyond the inaugural taildragger, two ready-to-fly four seat Sling 4s will arrive in the U.S. by the start of 2015 and will be available to demo. Ready-to-fly Sling Light-Sport Aircraft will be arriving every two months, with a few orders already placed. Four kit builders have joined the Sling builders brigade. 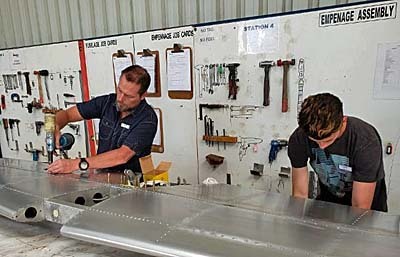 The Airplane Factory maintains a vigorous pace of development and manufacturing and enjoys good U.S. presence thanks to TAF USA's operation at the Torrence, California airport run by expat South African Matt Litnaitzky who has since gained permanent U.S. status. Last but by no means least is the BRM Aero TDO or Taildragger Option Bristell. This handsome airplane was much admired in trigear form after its arrival in the USA. Some see it as a new generation version of the SportCruiser, which is hardly a surprise as the company owner and chief designer is Milan Bristela who had a great involvement in the original development of the popular airplane sold today by U.S. 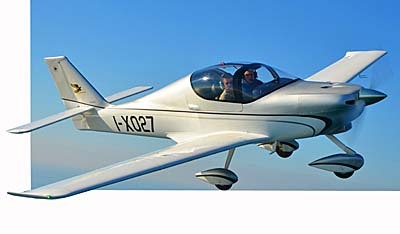 Sport Aircraft back when it was manufactured by Czech Aircraft Works (renamed Czech Sport Aircraft following an ownership change). Milan has developed BRM Aero into something of a boutique aircraft manufacturer custom building airplanes for customers in a very intimate fashion. Like The Airplane Factory, Milan stays very busy with new ideas and the TDO is another handsome airplane being added to the LSA fleet. You may not think taildraggers are for you as they do require some additional training (for insurance if no other reason) but nearly everyone admits these are good looking aircraft that draw appreciative looks in the air or on the ramp. Welcome to both Sling Taildragger and BRM's Bristell TDO! Although not in a taildragger Sling, you might enjoy this short video of a couple aviatrixes flying the Pacific Ocean shoreline from Sling's base in Torrence to Camarillo, California. Taildraggers may be among the least understood and most feared aircraft available in the LSA space … or for that matter throughout general aviation. While we have many good choices that I’ll list below, I have nonetheless heard from many readers or airshow visitors that they are uncertain about their operation of an aircraft that has no nosewheel. If you have no taildragger skills, you’ll also find it a challenge to get proper flight instruction in a “standard” aircraft. For those seeking new skills in flying, however, taildraggers may provide high satisfaction. Most who have crossed the barrier to taildragging subsequently look very fondly at such aircraft, seeing a sleeker yet gutsier, more rugged appearance. Of course, nosewheels dominate general aviation as they can be easier to land, especially in crosswinds, but once you learn the lesson of “happy feet” — or keeping your feet active on the rudder pedals throughout approach and touchdown — you may always yearn for more taildragger time. A couple days ago I wrote about the Sling 4-4-40 Challenge. I believe this to be of interest for a couple reasons. One is the fast build at an airshow ... much like the intense interest surrounding EAA's One Week Wonder (video) building of a CH-750 at Oshkosh. 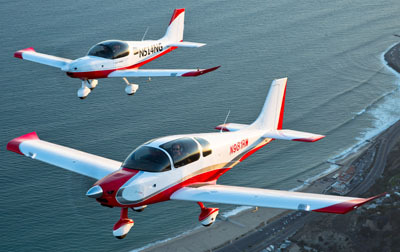 The other is my promise to offer coverage of the "New GA" or "LSA 4" planes — which are four seaters built by LSA companies using the technologies and techniques those companies know so well. South Africa's Airplane Factory (TAF) Sling 4-4-40 challenge — in which a Sling 4 was built in 4 days by 40 workers — marked yet another milestone for the Sling manufacturer. What normally takes a kit builder 1,000 hours to complete, took place at the 2014 Africa Aerospace event in just four days. Build team leader and company boss Mike Blyth reported it took their team 854 hours from bare kit to flight, although painting and perhaps some interior finish will take a bit more time, a situation similar to the One Week Wonder project. The team consisted of highly skilled workers, and even some marketing, admin and catering staff. (Good heavens! They let the marketing guys work on this ... that's brave of them!) TAF reported their team worked around the clock, with the day and night being split into 10 and 14 hour shifts, respectively. On Day 1, the center and rear fuselage were constructed and joined, the gear and undercarriage were assembled, and the engine was wired and made ready for installation. The handover to the night shift went seamlessly, TAF said, with a half hour handover period that saw 32 people working on the plane at once. The night crew then worked to get the fuselage on its wheels, engine and propeller mounted, and wings three quarters of the way complete. On Day 2, team members wired the engine and panel, the ballistic recovery parachute was installed, and the wings and empennage were nearly completed. With 45 minutes to go on Day 3, Sling 4-4-40 was rolled out of its build area, both wings were attached, landing and strobe lights were connected and working, and the avionics were fired up. As the plane was wheeled out for a celebratory team photo (nearby), company co-founder James Pitman pointed out that it took him and Mike four years to build the first Sling. Day 4 involved a dual inspection and final paperwork. "Support from the crowds was fantastic and [all day] hordes of people crowded around the plane." Mike Blyth turned the key and the Rotax 914UL powering Sling 4 "burst to life" amid cheers and applause from the crowds. "A Sling 4 was born in 4 days," Mike declared! The following day Sling 4 took center stage at the Africa Aerospace show. South Africa tail number ZU-TES was assigned to and affixed to the plane and it took to the skies. The plane performed flawlessly and put on a great show for all in attendance. The Sling was then flown back to The Airplane Factory's home base and was received with warm cheers from the entire staff (video below). TAF observed the 4-4-40 Challenge was one of many accomplishments already achieved by company. Mike and James flew the Sling 2 prototype around the world in 2009 and the Sling 4 in 2011. Also in 2011, the Sling 5577 Challenge took place, in which 5 men from the factory and 5 women who never had touched a rivet gun built a Sling 2 in 7 days. 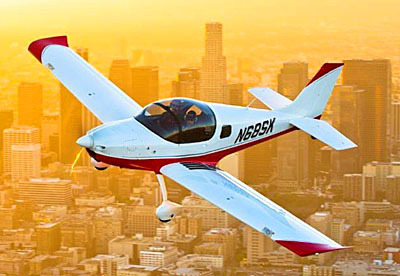 The Airplane Factory USA, located in Torrance, California (KTOA), will have a Sling 4 available for demo flights starting early 2015. A couple days ago I wrote about the Sling 4-4-40 Challenge. I believe this to be of interest for a couple reasons. One is the fast build at an airshow … much like the intense interest surrounding EAA’s One Week Wonder (video) building of a CH-750 at Oshkosh. 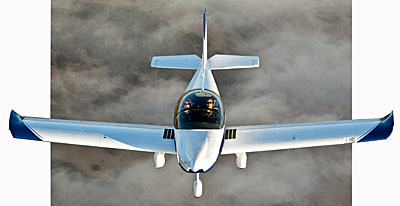 The other is my promise to offer coverage of the “New GA” or “LSA 4” planes — which are four seaters built by LSA companies using the technologies and techniques those companies know so well. South Africa’s Airplane Factory (TAF) Sling 4-4-40 challenge — in which a Sling 4 was built in 4 days by 40 workers — marked yet another milestone for the Sling manufacturer. What normally takes a kit builder 1,000 hours to complete, took place at the 2014 Africa Aerospace event in just four days. Build team leader and company boss Mike Blyth reported it took their team 854 hours from bare kit to flight, although painting and perhaps some interior finish will take a bit more time, a situation similar to the One Week Wonder project. Last weekend Zenith Aircraft held another of their open house events. At the Midwest LSA Expo a few weeks beforehand I asked factory pilot guru, Roger Dubbert how many people the company expected. His answer: a rather amazing "700." According to Zenith president Sebastien Heintz it was indeed another strong event, one they've repeated every year since setting up shop in Mexico, Missouri. "By all accounts and measurements, the 23rd annual Hangar Day was an incredible winner," summarized Sebastien. Among the highlights of the two-day festivities was the arrival of EAA's two Zenith aircraft. One was an EAA staff-built version of the CH 750 Cruzer (watch for our video pilot report to be posted soon) and the second was the One Week Wonder CH 750 that was completed during AirVenture with participation from over 2,500 people. As Arion Aircraft's Nick Otterback put it, "Since this month seems to offer many open houses I wanted to share ours. We are hosting our Seventh Annual Fly In Open House; we have held it the first weekend in October since we started Arion." As reported earlier Jabiru USA is celebrating 15 years and coordinated with Arion to hold their open houses on the same weekend. "We thought that was a great idea since most Lightning owners fly behind Jabiru power," added Nick. The company holds a cross country air race for bragging rights every year. "We have a Light-Sport Class, an Experimental Class, and an Unlimited Class, the latter for all of our fast kit friends and Arion's new XS. It has been a lot of fun over the years and made for some good ribbing among owners over the years." In the one-more-thing department, Nick noted, "If you want to see possibly the worlds largest Jenga game we've got it!" For more details, check with Nick via email or phone: 931-680-1781. Are you wondering what on Earth is a "4-4-40 Challenge?" It got my attention, too. 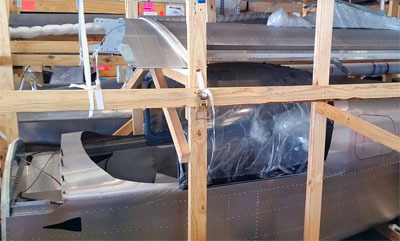 Following on the huge success of EAA's One Week Wonder building a Zenith Aircraft CH-750 during AirVenture 2014, The Airplane Factory is repeating an earlier challenge of their own. This time a team of 40 workers from Sling designer and manufacturer will attempt to build and fly a four seat kit called Sling 4 in only four days! The build is taking place as this is written at the 2014 Africa Aerospace and Defense Expo at the Waterkloof Air Force Base in South Africa. The team is working around the clock, with the day and night being split into 10 and 14 hour shifts, respectively. "This is not the first time that The Airplane Factory (TAF) has undertaken such an exciting project," reported company officials. Back in 2011, the Sling 5577 Challenge combined efforts of five men from the factory and five women who never had touched a rivet gun; they built a two seat Sling in seven days. This year on only the second day, TAF said, "A Sling 4 has been born ... well, just about! The team has made great progress on Day 2, so much that Mike Blyth, team leader of the build, declared that they are ahead of schedule." I'm no longer surprised by TAF projects. 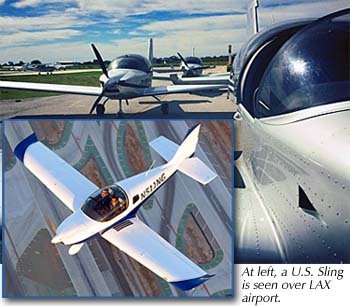 This company has not only built many airplanes for customers but has flown both their two seat LSA Sling and the four seat Sling 4 around the world, both shortly after the designs were completed. They should wrap up the speedy build in just four days. Wrapping up this piece, I wish to extend a "Happy Birthday" to an old friend of mine but also a man who was instrumental in the forming of the light aircraft space as we know it today ... such space now including Light-Sport Aircraft, light kit aircraft that Sport Pilot can fly, ultralights, and even Light GA airplanes referred to as LSA 4.0 that are getting ready to invade the factory certified aircraft sector. The man and my friend is Larry Burke who just celebrated his 80th birthday though you'd never guess he's accumulated that much wisdom. Larry can't get away to all the shows as he once did but he graced Sun 'n Fun 2014 with his smiling face and he consented to a video interview that appears below. Larry Burke founded the Light Aircraft Manufacturers Association back in the early 1980s and it still flourishes today thanks the solid guidance he offered back in the "wild west" days of the first ultralight aircraft. Whether you know it or not, you owe a debt of gratitude to Larry for his work over decades. In my role as president of LAMA I still often ask his counsel and he is always quick to offer his perspective as an engineer, entrepreneur, designer and builder of aircraft, and great enthusiast of light aircraft. Thanks, Larry! Catch a number of scenes of early light aircraft assembled by SportAviationMagazine.com in this video interview with Larry Burke. 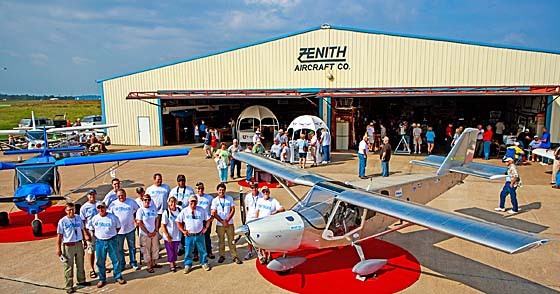 Last weekend Zenith Aircraft held another of their open house events. At the Midwest LSA Expo a few weeks beforehand I asked factory pilot guru, Roger Dubbert how many people the company expected. His answer: a rather amazing “700.” According to Zenith president Sebastien Heintz it was indeed another strong event, one they’ve repeated every year since setting up shop in Mexico, Missouri. “By all accounts and measurements, the 23rd annual Hangar Day was an incredible winner,” summarized Sebastien. Among the highlights of the two-day festivities was the arrival of EAA’s two Zenith aircraft. One was an EAA staff-built version of the CH 750 Cruzer (watch for our video pilot report to be posted soon) and the second was the One Week Wonder CH 750 that was completed during AirVenture with participation from over 2,500 people. As Arion Aircraft‘s Nick Otterback put it, “Since this month seems to offer many open houses I wanted to share ours. Read More About: Airplane Factory (USA), The Arion Aircraft, LLC Cruzer Lightning LS-1 Sling The Airplane Factory Zenith Aircraft Co.